Happy 40th Birthday to one of the greatest debut albums of all time. 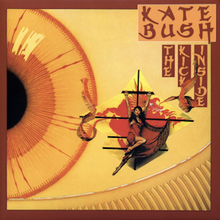 Released on this day in 1978 this album, which made no.3 on the UK album charts, heralded the arrival of the then 19 year old Kate, and gave her a stand out single success of Wuthering Heights, the first number 1 by a female artist with a song written by themselves. Coming from an artistic family Kate had recorded a demo tape of over 50 compositions which had been rejected by many record companies. However, through a mutual friend, the tape found its way to David Gilmour of Pink Floyd; impressed with what he heard Gilmour paid for a 3 track demo, produced by Andrew Powell, who went onto record Bush’s first two albums, it found its way to EMI who signed Bush, paving the way for The Kick Inside to be made and released. The album was made with a number of ‘veterans’ of the progressive rock scene such as Duncan Mackay, Ian Bairnson and David Paton who’d played together in bands such as Pilot and the Alan Parson’s Project. Bairnson, in particular, contributed a distinctive sound to the album, with his solo on Wuthering Heights being a specific highlight. The songs, all written by Kate Bush, over the previous years, many of whom were on the original demo’s that Gilmour had heard, are a remarkable in their complexity and sophistication. And when taking into account the age of Kate at the time, they show a maturity beyond her tender years; indeed ‘The Man With The Child In His Eyes’ was supposedly written when Kate was just 14 years old. The Kick Inside is an album of great beauty and artistry; with deeply complex and melancholic themes running through it. Accompanied by fabulous players and with a luxurious production from Andrew Powell, this album is one of my favourite albums of all time; followed by nine more albums of great beauty over the next 40 years of the career of the enigmatic Ms.Bush.